Give those around you affected by Crohn’s disease hope, strength and faith each time you wear this Crohn’s Disease Awareness Shirt. This eye catching design is sure to get you noticed and will help educate those with little understanding of this sometimes debilitating disease. From education come understanding, understanding breeds action and through action comes a cure. 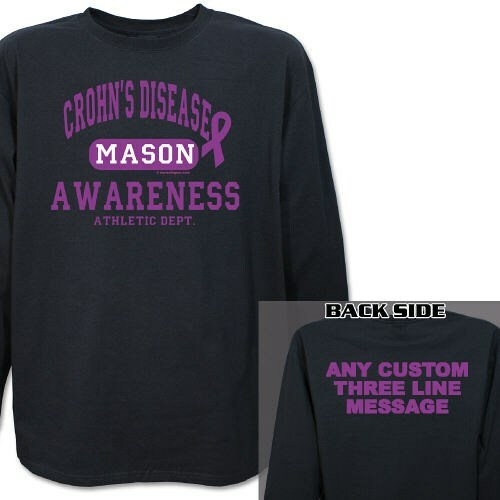 Our Personalized Crohn's Disease Awareness Shirt is available on our premium 100% cotton long sleeve shirt, machine washable in youth sizes S-L and adult sizes S-2XL. Includes FREE Personalization! Personalize your Awareness Shirt for Crohn's Disease with any name on the front and any three line custom message on the back. Very comfortable shirt. I like that the purple shows up well on the black. Additional Info Take a look at our ever growing collection of Awareness Apparel and Walk Gear to show your support today. Walk in style with this Crohn's Disease Awareness Shirt or our Crohn's Disease Awareness Hooded Sweatshirt at your next awareness walk. Be sure to also take a look at our Crohn's Disease Awareness Hat to show your support every day.